Arguably one of the most recognizable parks in the world, Millennium Park is without question one of the most spectacular places in downtown Chicago. For many years, two-thirds of the site that is now home to Millennium Park was controlled by the Illinois Central Railroad. Today, the 24.5-acre modern park is the centerpiece of the city, featuring performance facilities, public artwork, and majestic gardens. Millennium Park is bordered by Michigan Avenue to the West, Columbus Drive to the East, Randolph Street to the North, and Monroe Street to the South. 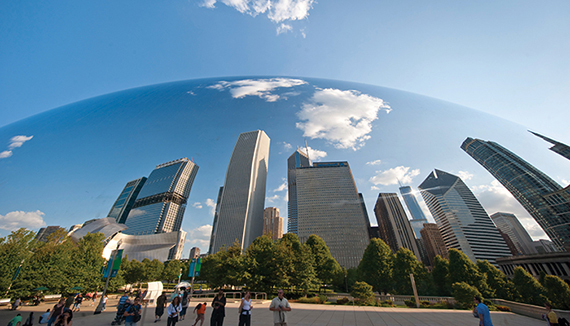 The Cloud Gate sculpture — "The Bean" — by Anish Kapoor reflects the Chicago skyline. Photo City of Chicago. Once an industrial wasteland, Millennium Park's remarkable transformation can be properly attributed to careful planning and thoughtful design. In 1997, Mayor Richard M. Daley envisioned turning the blighted area into a new urban park and public space that Chicagoans could use and enjoy. The original plan was focused on turning the desolate railroad tracks and parking lots into a 16-acre park and outdoor music venue, drawing inspiration from the Beaux Arts tradition of nearby Grant Park, another popular public space in Chicago. With much commitment and collaboration from the private sector, including the involvement of lauded architect Frank Gehry, the project morphed into a more contemporary and ambitious undertaking that drew in a collection of world-renowned artists, architects, planners, and landscape architects and designers. On any given day or night, Millennium Park is a lively destination, with visitors exploring nearly every corner of the space. Frank Gehry's Jay Pritzker Pavilion, a modern outdoor concert venue, is the centerpiece of the park, with the capacity for 4,000 people in seats and an additional 7,000 on the Great Lawn. The most iconic feature of the park is "Cloud Gate," a modern sculpture by Anish Kapoor. More commonly called "The Bean," the sculpture's smooth surface gives visitors the opportunity to see Chicago from a markedly different perspective. Crown Fountain, designed by Jaume Plensa, uses water, light, video, and glass to create a reflecting pool with two towers that project the faces of 1,000 Chicagoans. Lurie Garden is a four-season urban oasis that was designed to honor to the city's motto "Urbs in Horto" (City in a Garden), a reference to Chicago's development of flat marshlands into a striking and robust city. Lurie Garden can be enjoyed at any time of year. Its grasses brave the harsh winter weather while perennials in spring share the warming air with birds and butterflies. 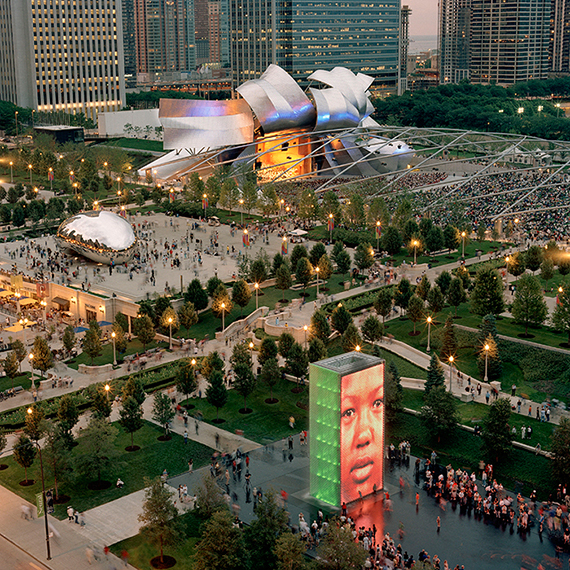 Interactive public art is a major point of interest and defining feature of Millennium Park. During summer months, some installations incorporate water. In the winter, an ice skating rink set up near Cloud Gate is a major tourist attraction. Photo Terry Evans, City of Chicago. Millennium Park is a 17/7 space that serves as a focal point for downtown Chicago. The public art, events, location, and access all combine to make it a truly world-class park. Located in the heart of downtown Chicago, Millennium Park acts a central public space accessible by numerous modes of public transit. The park is serviced by several major bus lines through the city and is also accessible by the city's famous L rail lines as well as the heavy rail that extends to the Chicago suburbs. The McDonald's Cycle Center has 300 monitored bike parking spaces, lockers, and showers that provide an incentive for bicycle commuters. New bike-share stations scattered in and around the park also add options for transportation. The unique architecture and public art was created by some of the most innovative minds in the artistic world. 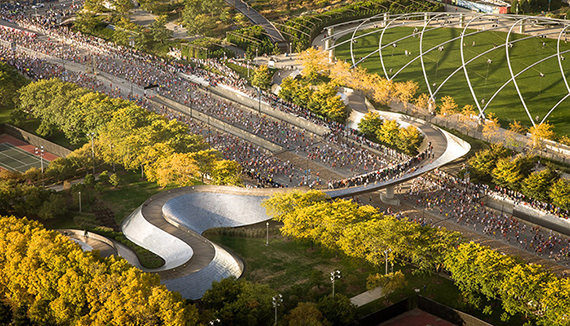 Examples include Frank Gehry, who designed the Jay Pritzker Pavilion and BP Bridge; Anish Kapoor, who created "Cloud Gate," or "The Bean," as it is lovingly called by Windy City residents; and Jaume Plensa who designed Crown Fountain, an icon that attracts families and children who play in the art. The magnitude of attraction to Millennium Park has been an economic boon to the city of Chicago. Several studies estimate that the park has increased by over $1 billion dollars the value of residential development downtown. There are also strong indications that the park has contributed greatly to a steady increase of tourists visiting Chicago each year, estimated at over $1.2 billion. The Annual Summer Film Series welcomes Chicagoans and visitors into Millennium Park for many evenings throughout the summer. Movie-goers can kick back and enjoy a variety of well-known and classic movies in a seat in the Jay Pritzker Pavilion or on a blanket on the Great Lawn. From May through mid-September Millennium Park presents over 60 performances of symphonies, music, dance, opera, Broadway hits, and other entertainment. During the summer months, Millennium Park also hosts free summer workouts, including yoga and Pilates, which take place on the Great Lawn. Over Labor Day Weekend, the Chicago Jazz Festival is held in Millennium Park. Millennium Park has been celebrated for its connections between different areas. Here a pedestrian bridge designed by Frank Gehry allows pedestrians to cross over Columbus Drive — a major thoroughfare in downtown when there is not a marathon happening. Photo Ken Tanaka, City of Chicago. 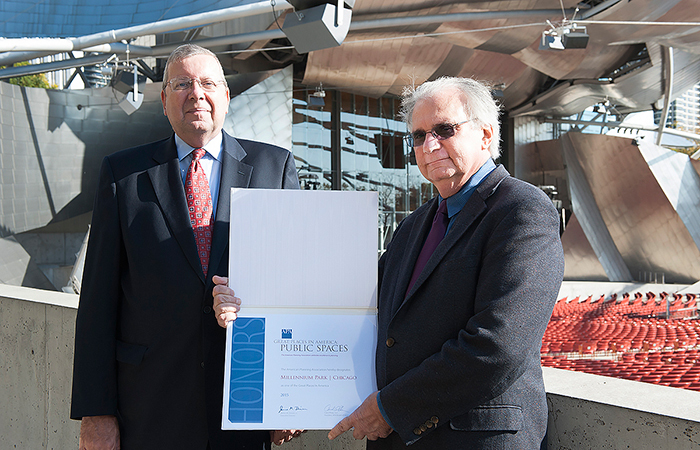 APA Executive Director James Drinan, JD, presents a certificate to Ed Uhlir, FAIA, Executive Director of the Millennium Park Foundation. Photo by Walter Mitchell, City of Chicago. 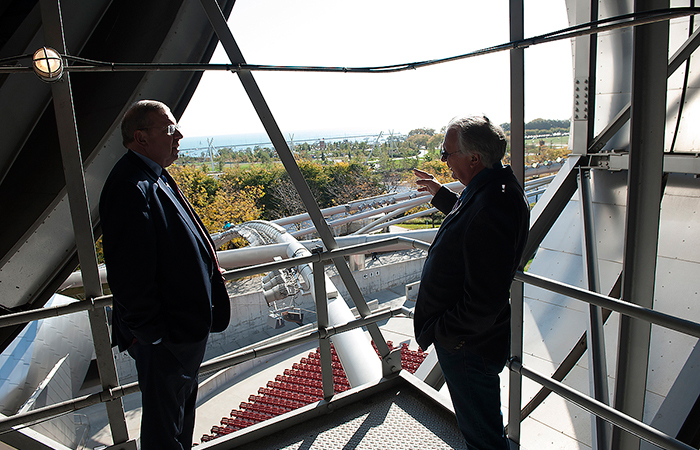 James Drinan and Ed Uhlir enjoying the view from inside Jay Pritzker Pavilion at Millennium Park. Photo by Walter Mitchell, City of Chicago.